Adm. James Stavridis, an NBC News analyst and dean of the Fletcher School of Law and Diplomacy at Tufts University in Massachusetts, said, “I’ll give you three reasons” why the situation is especially dangerous now. “One is [Kim’s] own precarious situation in command of the nation. Number two is the instability in South Korea. We’ve just seen the South Korean president indicted, arrested, and incarcerated. Kim is “desperate in maintaining his rule by relying on his [development of] nuclear weapons and ICBMs,” Thae Yong-Ho, the most high profile North Korean defector in two decades, told NBC News. “Once he sees that there is any kind of sign of a tank or an imminent threat from America, then he would use his nuclear weapons with ICBM,” he added. Thae warned America and its allies to be prepared. North Korea is estimated to have at least eight nuclear weapons but has not demonstrated the ability to attach them to a long-range rocket, an ICBM, capable of hitting the U.S.
Thae said the world need only look at Kim’s past actions to see what he is capable of. The young leader has reportedly been responsible for purges and executions of top officials and even members of his own family. Last month, according to U.S. and South Korean intelligence officials, he masterminded the assassination of his own half-brother, Kim Jong-Nam, at an airport in Malaysia. Thae, who is set to leave the protection of South Korea’s National Intelligence Service and enter South Korean society, has said he will not remain silent. “Thae’s decision to speak out could be the most dangerously subversive development of Kim Jong-Un’s reign,” the One Free Korea blog said. “More than … any other person,” Thae could be a key voice to Koreans on both sides of the DMZ, and to the wider world. 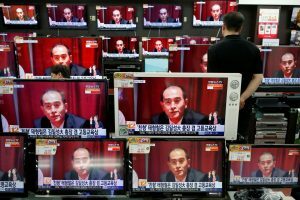 But Thae could also emerge as a counter-propaganda force in both North Korea, where the Kim regime has been mocking the recently-impeached South Korean President Park Geun-Hye, and in the South where political storms obscure political and geopolitical realities North of the DMZ, Geostrategy-Direct reported on Dec. 21, 2016. In a way that Hwang Jang-yop was not able to, “Thae can become a leader among the divided North Korean diaspora in the South and help build their influence inside South Korea and (with his excellent command of English) internationally,” the report said. Sources inside North Korea say there is an audience even among Pyongyang elites for Thae. North Korean state propaganda that heavily pushed on the popular uprising against South Korean President Park Geun-Hye may have backfired by “planting similar ideas” in the minds of North Koreans. This entry was posted in N. KOREA. Bookmark the permalink.